To follow up on Philip Pilkington’s posts on liquidity preference. I propose the following table as a preliminary way of conceptualising the range of assets subject to liquidity preference. 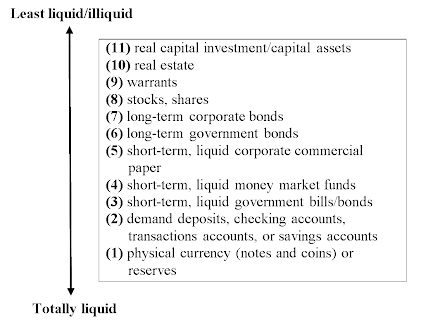 At the top, we start from the least liquid assets and move down the list to the most liquid asset (physical currency or high-powered money held as reserves at a central bank). One can quibble about the order of some of the assets at the top and middle (such as stocks and shares), but a rise in liquidity preference involves investors selling off or shunning purchases of assets at the top of the list and moving into assets at the bottom. For Keynes, a rising liquidity preference lowers demand for less liquid/illiquid assets and lowers their price (raising their yields), while it raises the prices of liquid assets (lowering yields). (4) short-term, liquid money market funds. Philip Pilkington, “Keynes’ Liquidity Preference Trumps Debt Deflation in 1931 and 2008?,” Fixing the Economists, February 24, 2014. Philip Pilkington, “What is a Liquidity Trap?,” Fixing the Economists, July 4, 2013. Philip Pilkington, “Financial Markets in Keynesian Macroeconomic Theory 101,” Fixing the Economists, July 24, 2014. Philip Pilkington, “Paul Krugman Does Not Understand the Liquidity Trap,’” Fixing the Economists, July 23, 2014. Kelton, S. 2012. 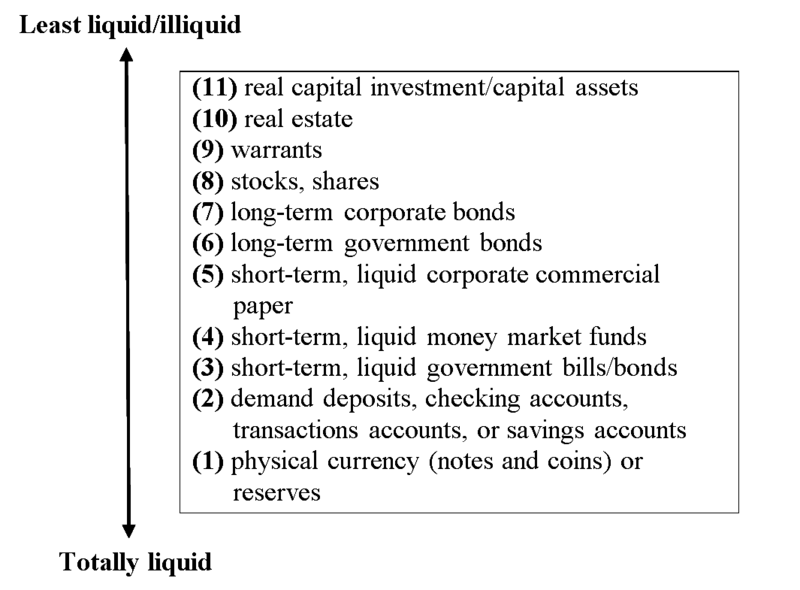 “Liquidity Preference,” in J. E. King (ed. ), The Elgar Companion to Post Keynesian Economics (2nd edn.). Edward Elgar, Cheltenham. 372–378. Nice. I reckon that this is pretty accurate, yes. Did Keynes include short-term, liquid government bills/bonds as cash ? It was always my impression that he didn't - and that when he refers to bonds he means both stocks and govt bonds. "a rise in liquidity preference involves investors selling off or shunning purchases of assets at the top of the list and moving into assets at the bottom." It must involve an equal number of investor buying these assets, right ? It is more accurate to say that the market clearing price has changed for different assets classes to reflect changed preferences. In 2008, the market for mortgage-backed securities (MBSs) collapsed, and those assets became virtually illiquid -- that is, not even large falls in the prices of those toxic assets could "clear the market". So, no, what you said does not necessarily follow at all. Paul Davidson, Keynes Solution: The Path to Global Economic Prosperity, p. 66ff. Davidson, Paul. 2008. “Securitization, Liquidity, and Market Failure,” Challenge 51.3 (May–June): 43–56. "It must involve an equal number of investor buying these assets, right ? " You could have lots of sellers and only a few buyers, for example. Yes, the qty bought and sold must match but the number of investors involved on either side could differ. Why was the new lower price for MBS's not market-clearing ? Even the most toxic had a market value above zero I think, and at that price everyone was happy to hold the entire qty of available MBS's or the price would have fallen further. So there was a market clearing price for MBSs -- even though many people who wanted to sell them could not sell them? In 2008 the markets for these mortgage-backed securities froze up and very many people could not sell them **at any price** even though they wanted to. I trust you can see why your comment is nonsense. No - I truly don't. I get that people wanted to sell but couldn't. But this is because no-one wanted to buy at the prices they wanted to sell at. There were (probably) others who would have bought at much lower prices, but no-one would sell at those prices. This is a very illiquid market, for sure. But: At the the prevailing price the entire qty was being willing held. To me that's a market clearing price (I guess you can define it differently if you wish). "At the ... prevailing price the entire qty was being willing held. Um, no, people were not willingly holding them: people wanted to sell them, but couldn't find buyers. They were very much "unwilling" holders.
" (I guess you can define it differently if you wish)." And again: um, no, the concept of a "market clearing price" has a precise definition in economics, and one can't simply redefine it in your own idiosyncratic way. I'm using the standard definition of "market clearing price"; it would appear that you don't even understand that definition. Given the choice between selling at the prevailing price and not selling at the prevailing price they choose to hold. How is that not holding willingly.? The fact that they would really like to sell at a higher price is totally irreverent! Well I agree the only meaningful definition is " the price of a good or service at which quantity supplied is equal to quantity demanded". Buy you seem to want to say that if anyone would be willing to sell at above this price but can't - then the market isn't clearing. I don't get that. I can't explain it any more clearly that. If you can't understand this point, then clearly any further debate is a total waste of time. "A market clearing price is the price of a good or service at which quantity supplied is equal to quantity demanded, also called the equilibrium price." So very many people were "supplying" MBSs in the sense of wanting to sell them on secondary markets, but couldn't even find buyers at any price -- and you think that the market was in equilibrium? You should be ashamed of your ignorance of basic economic concepts. "But this is because no-one wanted to buy at the prices they wanted to sell at"
isn't that the mainstream economic definition of a surplus (glut)? "isn't that the mainstream economic definition of a surplus (glut)? " Right! But Rob can't seem to grasp basic definitions. Well, obviously and by our agreed definition they were trying to sell at above the market clearing price if they couldn't find buyers.
" obviously and by our agreed definition they were trying to sell at above the market clearing price if they couldn't find buyers." (1) So you agree the price of MBAs couldn't possibly have been a market clearing price? (2) what if people -- as in fact was the case -- couldn't find buyers at any price? There was, then, **no potential market clearing price**: the market froze up. I don't much about the MBS market but based on what you say there was an illiquid market where the sellers all wanted a higher price than all the buyers wanted to pay. So no transactions took place, You are free to call this "freezing up" if you like. This doesn't violate any principals of market-clearing prices as far as I can see, though I suppose if no transactions are taking place (and I find this hard to believe for the MBS market even at its low-point) no-one will know what the market clearing price actually is. just thinking, it could be that people can't afford to sell at the supposed market-clearing price, or that people can't afford to pay the market clearing price. "Most economists e.g., Paul Samuelson, caution against attaching a normative meaning (value judgement) to the equilibrium price. For example, food markets may be in equilibrium at the same time that people are starving (because they cannot afford to pay the high equilibrium price). Indeed, this occurred during the Great Famine in Ireland in 1845–52, where food was exported though people were starving, due to the greater profits in selling to the English – the equilibrium price of the Irish-British market for potatoes was above the price that Irish farmers could afford, and thus (among other reasons) they starved." essentially, if people have only goods/assets which they can't afford to sell at the supposed market clearing price, that means bankruptcy and liquidation. If people can't afford to pay the supposed market clearing price, that means going without, i.e. starvation in the most extreme case. What LKs point in this thread is is totally lost on me. Perhaps he's just saying that some markets are illiquid and market knowledge is poor so the market-clearing price is never found.